Elimination of paper logs or error-prone manual data entry. TransCore is the industry standard for fleet yard applications. National and regional motor carriers use our RFID technology to track trucks, trailers, and other equipment as they arrive and depart yards. Utilizing this technology allows carriers of all fleet sizes – large and small – to improve their equipment’s productivity. Manually tracking your fleet and intermodal equipment can be a time consuming and an error prone endeavor. Mistakes happen and data is often lost. Running an efficient yard is impossible without complete and accurate utilization data and efficient asset control. 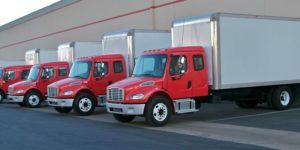 Before you spend another dollar on new fleet equipment, make sure you’re getting the most out of what you already have. TransCore’s Amtech® brand Encompass® readers and tags offer industry leading, proven RFID systems and are the best choice to automate your asset management system. Our systems provide timely, accurate information that reduce costs and improve efficiency. Our systems give yard personnel real-time data that effectively monitors equipment utilization and fleet asset inventory. These systems can capture exact equipment utilization rates through historical fueling, maintenance, and location data, reducing the risk of lost equipment. This allows managers to spend more time concentrating on planning, supervising, and directing operations. Faster decision making results in a more efficiently managed yard. Automatic vehicle identification (AVI) technology to get your authorized trucks in and out of scale/weigh facilities quickly and efficiently. When your business relies on accurate weight measurements of hauled material – from solid waste to valuable commodities – you can trust TransCore’s proven automatic vehicle identification (AVI) technology to get your authorized trucks in and out of scale/weigh facilities quickly and efficiently. Our hands-free, worry-free solutions can help businesses in many industries, including agribusiness, mining, aggregate, and sand processing with enhanced through-put, increased security, quick and efficient truck entry and exit, automatic load revenue transaction process, and account for transactions with maximum accuracy and convenience. Transportation tags affixed to your trucks and trailers contain embedded data that is captured by RFID readers and sent to a host computer via your data network. Stationary and/or mobile readers are stationed at strategic entry and exit points, as tagged vehicles/equipment pass the reader the system automatically captures encoded data from each tag, typically identifying the specific vehicle, without a prompt from drivers or other workers. This tag read initiates an entry authorization and load weighing process where the truck weight (loaded or empty) is accurately captured. A similar transaction is processed upon exit. The material weight dropped or picked up is calculated and a revenue transaction is generated. TransCore’s Amtech® brand Encompass® readers and tags offer industry leading, proven RFID systems and are the best choice to automate your weigh scale RFID applications. Our systems provide timely, accurate information that reduce costs and improve efficiency. 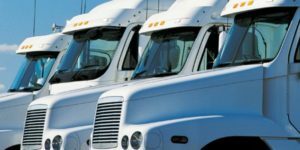 Businesses that maintain service and delivery vehicle fleets are able to dramatically improve their return on investment. Businesses that maintain service and delivery vehicle fleets are able to dramatically improve their return on investment while improving customer service with TransCore’s RFID-based solutions. Our broad product line of tags and readers allows tailoring of an AEI (Automated Equipment Identification) system to your exact requirements. Trucks, vans, and other heavy equipment assets can be tracked, providing an accurate database to manage all of your moving equipment and automate your critical management systems. This provides timely, accurate information resulting in reduced costs and improved efficiency, keys to new levels of productivity. As tagged vehicles/equipment pass a reader, the system automatically captures encoded data from each tag without prompting from drivers or other workers. The vehicle data is then transmitted in real time to your host computer application. Vehicle status information can then be retrieved from both central and remote data stations. Drivers avoid time consuming wait lines because the system eliminates manual tasks such as handwriting, paper logs or computer keying. The system – which operates day and night, rain or shine – can reduce idle time, improve space utilization, and increase security in virtually all facility operations by eliminating manual data entry. Reducing idle time means faster access to the road, less fuel consumption, and quicker service and delivery for your customers. Our system gives service personnel real-time data so they can effectively monitor equipment utilization. This frees personnel to spend more time concentrating on planning, supervising, and directing operations. They can capture exact equipment utilization rates through historical fueling, maintenance, and location data, reducing the risk of lost equipment. Faster decision making results in a more efficiently managed service environment. TransCore’s Encompass® readers and tags offer industry leading, proven RFID systems and are the best choice to automate your service and delivery RFID applications. Our systems provide timely, accurate information that reduce costs and improve efficiency. Our broad product line of tags and readers allows tailoring of an AEI (Automated Equipment Identification) system to your exact requirements. Trucks, vans, and other heavy equipment assets can be tracked, providing an accurate database to manage all of your moving equipment and automate your critical management systems. This provides timely, accurate information resulting in reduced costs and improved efficiency, keys to new levels of productivity.